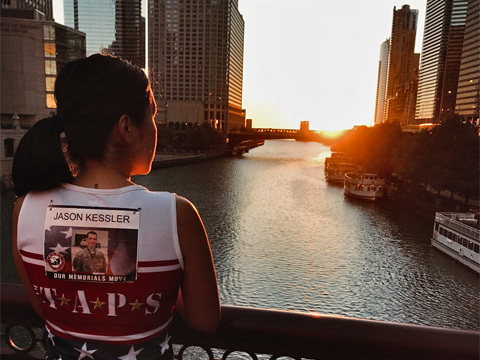 Race in the 2019 Bank of America Chicago Marathon for Team TAPS set for Sunday, October 13, 2019! The mission of TAPS is to care for families of America's fallen heroes. Registration for the 2019 Bank of America Chicago Marathon is now closed. Please visit our website for other ways to run with us in 2019! 1. Apply by filling out the Team TAPS Bank of America Chicago Marathon Application. 2. Upon selection, fill out the credit card authorization and set up your personal fundraising page provided to you by Team TAPS. We look forward to welcoming you to Team TAPS and sharing our mission with you. We celebrate that you are committed to running the famous Bank of America Chicago Marathon with Team TAPS. Please note that due to high demand, completion of this application does not guarantee your selection as a Team TAPS charity runner for the 2019 Bank of America Chicago Marathon. Runners who apply prior to November 18, 2018 will be notified of their selection or wait list status the week of November 19, 2018.